Interior Minister Aryeh Deri said today his party would recommend to the President to place the task of forming the government upon Binyamin Netanyahu after the upcoming elections. 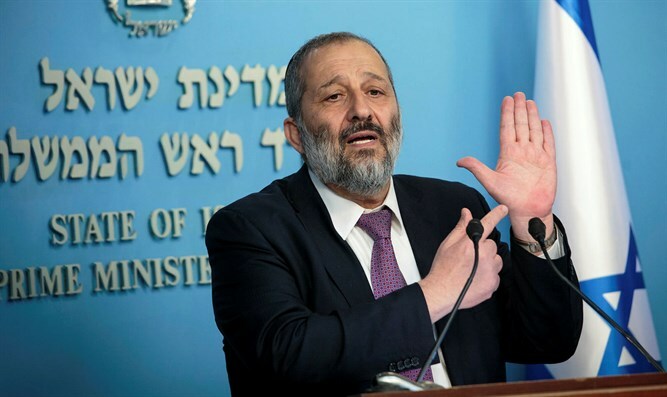 "This is the best government we've had from a social point of view and from the standpoint of the status quo," Deri said. "Netanyahu is our candidate for Prime Minister. We'll recommend only him. On the new party of Bennett and Shaked, Deri said "I don't like it when colleagues who were part of the previous government suddenly talk against Netanyahu. It's not fair, I'm against the split, it hurts the government, it'll be difficult to form a coalition," Deri said. The Shas Chairman criticized former Minister Eli Yishai, explaining why he would not cooperate with him. "As far as we're concerned, there's one principle in Shas, that is obedience to the Council of Torah Sages, and anyone who rebels or doesn't accept the authority of the Council of Torah Sages cannot be in Shas."